It’s a familiar, yet distressing scenario: Pouring your heart and soul into what you think is a killer direct mail piece – sending it out and expecting new leads and business to just start flooding in. Instead, the only sound you hear is crickets… No reaction. Zero. Zip. Nada. What happened? Was it really that bad? 1. Use an interrogative headline. Questions force the mind to engage and respond. Asking questions is important in walking the recipient down the path to a close (call to action). For example: “Where would you fly with a free airline ticket? London, Barbados, San Francisco?” Questions stimulate the imagination. Use them to get your prospect’s mind thinking about their needs and your solution from a fresh perspective. 2. Sell your offer, or your product or service. Too many marketers use direct mail to sell their products and services – an approach certain to make sure your direct mail will look just like everything else your prospect receives in the mail. How will your solution make their lives better? Focus on that and remember, less is more. Your direct mail piece should contain a single, concise, targeted offer – not a lengthy description of everything your firm offers. 3. Tell a story. Stories are powerful tools for engaging your target audience at an emotional level, which can be very powerful. Your prospects want to do business with a company they relate to and understand. They want to know more about your values and what you’re committed to. Storytelling is the most powerful way to convey these ideas. Bonus: Storytelling is also is a powerful way to differentiate your company from its competitors. 4. Include a clear and prominent call to action in your copy. You’ve intrigued your target audience with a story that appeals to their emotions, but is it clear what you want them to do? Use typography and design to naturally guide them to your offer. A prominent headline and deadline can be used to motivate them to take action on it. 6. Make sure your copy is formatted to be easily scanned. Today, more than ever, your prospects are time-starved. 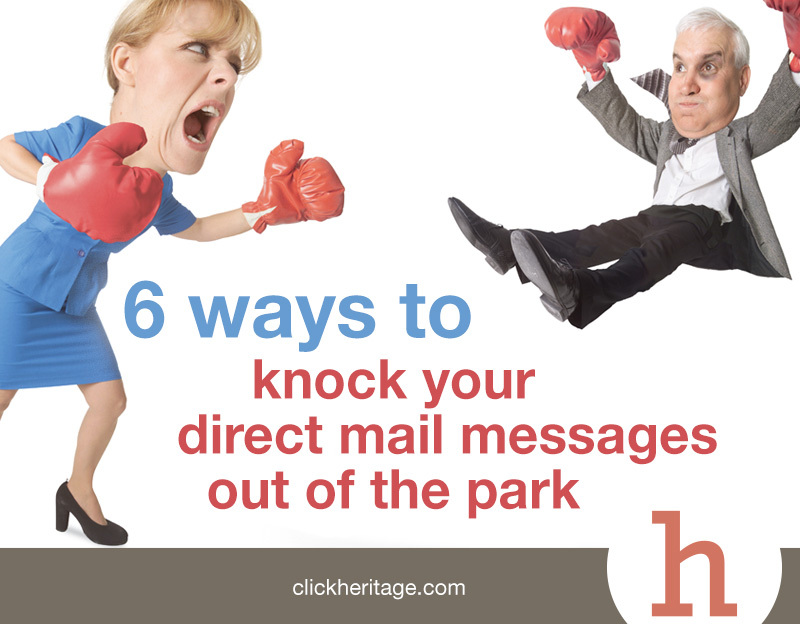 They may only look at your direct mail piece for a few seconds. Make it easy for them to visually scan and understand its key message and offer. Use bullet points and headings to guide your prospect’s eye along a clear path to your call to action. Long paragraphs of text will cause your prospects to give up and toss your direct mail piece into the nearest recycling bin. Keep this checklist handy and use it to gauge the effectiveness of your next direct mail campaign, while it’s still being designed. Using these tips as a guide can help you avoid expensive mistakes and cultivate more prospects and sales.